La Mar Resort and Café is situated on the West End Road, one mile west of the round-a-bout in the city center and the beach. The Negril Lighthouse and Rick’s Café are west of La Mar. In addition to the La Mar Café, there are numerous cafes and restaurants in close proximity. Taxi cabs, mini buses are readily available for hire, so are bicycles, moped and motor cycle rentals.At the hotel, guests will find cozy rooms, all with ceiling fans and a private shower. 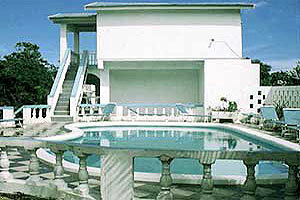 Guests can enjoy the pool and sun deck or relax at the bar. The hotel has an on site café/restaurant as well. On the nearby beach, guests will find seven miles of lovely white sand and plenty of things to do. Watersports offered on the beach, but not operated by the hotel, include windsurfing, sailing, parasailing, snorkeling, skiing, jet skiing, scuba diving, glass bottom boat, and deep sea fishing.